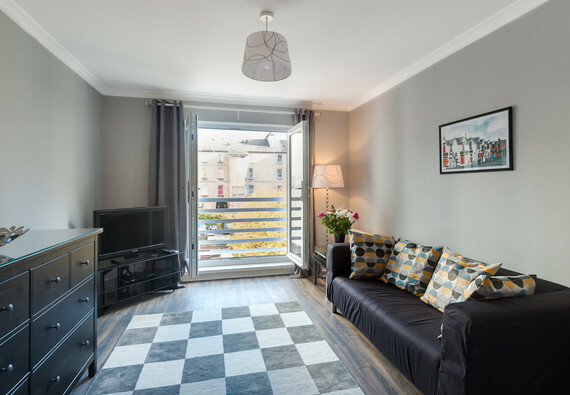 Brunswick Apartment is located in the highly popular Merchant City district of Glasgow City Centre and is a perfect base for business or leisure travellers. Brunswick Street is within 10 minutes walking distance of Glasgow Queen Street and Glasgow Central Station. This serviced apartment has been fully modernised and furnished to a high standard providing guests with everything they require for short or long stays. The building has a security entry and intercom service and is well illuminated externally. The apartment can be reached via the internal stair case, and the neighbourhood provides a safe and secure environment for guests of all background. Inside, the reception hallway has a stylish dresser with three deep drawers for additional storage requirements. The bathroom has been recently refurbished and has a modern three piece suite with bath and shower over. The spacious double bedroom, includes fitted mirrored wardrobes, bedside reading lamps, further drawer storage and a double glazed window overlooking an internal leafy courtyard. The wooden double bed frame is elevated and luggage could be stored under the bed. The open plan living area includes 32" TV and DVD player connected by HDMI for extra quality of picture. WIFI is complimentary to all guests. There is an adjoining dining space which houses a smart dining table and four chairs should you have any guests visiting for diner. The room is generously bright on account of the newly installed French windows which can be full opened. A foldable table and chairs is stored within the apartment which guests are welcome to use whilst the doors are open. The doors are double glazed also, meaning the apartment is among the quietest you will find in the neighbourhood. The kitchen is modern and new, and includes all necessary appliances . The kitchen cupboards contain all kitchen inventory required for home cooking, plus there is a washing machine and clothes horse for keeping on top of your laundry. Guests arriving to Glasgow Airport can be at the apartment by taxi within 20 minutes or slightly longer on the Airport Bus Service which has a drop off point at George Square close to the apartment. This property is highly recommend for a comfortable stay in the city's most desirable neighbourhood. A 25% deposit is payable on booking and the outstanding balance is due no later than 14 days before your arrival. Keys may be collected from our City Centre office at 59 James Watt Street, G2 8NF or we can offer a "meet and greet" service, whereby a member of the team will meet you at the apartment to provide keys and show you the layout/specific details of the flat. We require identification and a security deposit of £100 which is fully refundable when you sign for the keys. Check-in time is between 2:30pm and 8pm, but we will always try to allow access earlier if requested subject to availability (Later check-in can be organised by prior arrangement and will be subject to an additional fee). Check-out is by 10:30am. Sleeping arrangements One bedroom with a king size bed. Parking notes There is no private parking at this apartment but we can offer discounted pre-validated tickets for nearby carparks operated by Q-park and City Parking, which allow guests to park for £6.00 per 24 hours. Further information will be given at check-in or upon request. Accessibility statement This apartment is located on the second floor and there is no elevator so unfortunately the property is not wheelchair accessible. No reviews yet for Brunswick Apartment.